RCKP RIGHT 71-73 MUSTANG SB/BB RH POWER RACK AND PINION FOR SMALL & BIG BLOCK RIGHT-HAND DRIVE 1971-73 MUSTANG OR 1971-73 COUGAR. CONTAINS: RCKP-55, 7900-293, TIER-03, EE-02. ISFT-05 FOR USE WITH OEM STEERING COLUMN WITH RAG-JOINT FLANGE. NO STEERING COLUMN PARTS ARE INCLUDED. 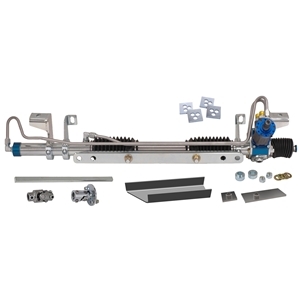 Power Rack and Pinion System for OEM Steering Column (Right-Hand Drive - Australia) - Fits 1971-73 Mustang and Cougar - Contains power rack and pinion unit, intermediate steering shaft and universal joints, tie rod adapters, eccentric eliminators and weld-in frame plates.